MOM Park – Gellért torony Csörsz u. 41. 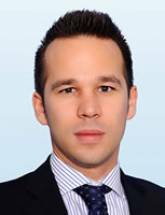 Bence Vécsey joined Colliers International in 2013 as Director and Head of Investment Services and has been responsible for management and operations of the team in Hungary helping the firm to establish itself as the leading investment consultancy business in the country. Bence graduated from the Budapest University of Economics Sciences with majors in Capital Markets and Corporate Finance and is a member of RICS. As director of the Hungarian investment team, he has been instrumental in completion of a number of high-profile investment transactions (both sell-side and buy-side) across all main real estate asset classes with a cumulative volume in excess of EUR 1 bln, including: Nordic Light, Park Atrium, Arena Plaza, Green House, Infopark E, Tesco Óbuda, Auchan Distribution Center, inNove Business Park, M1 Business Park, CA Immo portfolio and Park Atrium, among others. Bence’s scope of responsibilities includes structuring and execution of property sale and acqusition processes, commercial due diligence and advisory, commercial negotiation of sale and purchase contracts and supplementary transactional documentation in addition to deal coordination in order to ensure that clients’ milestones are met successfully and on time.